I SUBMIT TO YOU THAT EVOLUTION IS A FAIRY TALE THAT’S BEING PASSED OFF AS SCIENCE. When a fairy godmother touches a frog with her magic wand and turns it into a handsome prince, everyone knows that’s a fairy tale. 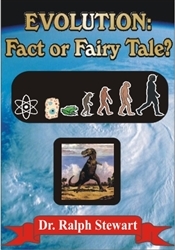 But when TIME touches a frog and turns it into a prince, that’s supposed to be science!” Thus begins Dr. Ralph Stewart’s brilliant expose’ of the fairy tale of evolution. Is it possible to believe the Bible AND Evolution? What about the science of probability? What scientific “proofs” point to evolution and what “proofs” point to creation? Few men are as well qualified to speak on this subject as is Dr. Ralph Stewart. He speaks with understanding and authority in this vital area.